It seems incredible to me that in this day and age we British still clung to some crazy law for so long that was introduced during the war to prevent factory workers from drinking too much the night before and then not being fit to work with the munitions in the morning. 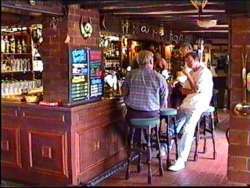 The pub opening times aren't as bad as they used to be but so many bars still close at 11 O'Clock, purely because it's not worth their while staying open any later. Getting a late licence isn't exactly easy and the unfortunate thing is these restrictions probably play some part in the tide of antisocial behaviour that sweeps our cities each night around 11 or 12 O'Clock. Drunken yobs that have been on a booze binge fighting, urinating in doorways, messing the place up with discarded takeaway food etc. As well as not being pleasant to see, this also puts a huge strain on various public services. With all this going on, who would want to work in the police force or in the casualty department of a hospital on a weekend? I think that relaxed licensing hours and making it easier for pubs to get a licence to close later could help ease this problem. Instead of spending an absolute fortune each year on hospitals and policing each year the government could be raking in millions of pounds in extra tax as well as creating a more continental environment for tourists that visit the country. What do the French, Italians or even the Americans think about our pubs? At the rate we are going I reckon it will pretty soon be normal to pay 4, 5 or more for a pint of beer and by the year 2020 it is likely that that will be more than a tenner(or the equivalent in euros if that's what we are using by then!). I just wish the government would stand behind the traditional British pub and see it for what it is, a great focal point for our communities and one that is sadly starting to become extinct. This is to encourage you to b*gger off to get a kebab or fish & chips or chicken chow mein when you night out comes to an end. Prolonged binge drinking is yet another reason to believe in the Darwinian theory of species survival. Stupid intellectually challenged individuals killing themselves by ruining their livers and kidneys by consuming what is in fact, poison. But hey, if these people are prepared for the intensive agony leading up to their regretful deaths because there is not enough organ donors,who are we to judge. Anyone got a bad lower back ache that just won't go away? I live close to a pub that closes at 1am and all the problems you highlighted regarding pubs closing at 11pm just get pushed back to 1am. Increasing opening hours doesn't solve any problems. Britain has always been a nation of binge drinkers and nothing will change that. It is futile and stupid to believe that increasing opening times will create some kind of continental cafe culture. Britain's go out to get drunk not to socialise in a responsible adult manner. We should be encouraging people to drink less not more. marjorie and sleepless are the scourge of the drinking classes. god help their neighbours if they're heard farting next door. sleepless would have the old bill round. I agree that some pubs have a bad rep for drunkeness(you dont say, they're pubs! )vomiting in gutters, urination, fighting, all the rest but to close them down would mean the idiots who do that sort of thing regularly would go to off licences and buy 3 times the amount of booze with the savings on pub prices so they could annoy the neighbours more often if they wanted. Plus whats so wrong with a pint or two, marjorie? especially if you graft for the money to apy for it. You'll find that the rise in price of beer isnt a pubs fault. There are tons of pipes from the cellar to the bar and they can cost anywhere between 6grand to 22grand to set up. Oh and dont forget the measly wages since most bar tenders work for minium wage. So imagine if a pub was open those few more hours, you wouldn't even break even with the cost of electricity and water and wages. But hey, what am I saying, I could do with a few extra shifts. And Rat, you can take it home. But its illegal to drink on the street and the pub would be providing an open vessel. Well, it is nearly 2010, and the £5-00 pint has not yet arrived, but the £5-00 supermarket case has, a lot better having the tv on, 6ft pc projector screen on, and a 50p can of cold lager in your hand typing away, instead of getting ready to go down the pub and spend whats left. in a way tho I fink they r avin fun .. why spoil it ? to be honest I think pubs should only let people drink a limited amount of beer/wine . there is youths everywhere getting slaughtered which is also not a pleasant site. Cannot agree more!!!! I have spent 13 years of my life in Russia - places are open 24 hours, everybody is happy. Greece, Spain - everywhere the same! Closing pubs at 11pm (or even at 1am like in Scotland) doesn't solve anything, the ones who want to drink and get messed up - will do it anyway! I enjoy haveing a good night out with my friends, but I am finding it harder and harder to enjoy it because pretty much every decent traditional pub in our area has closed down and been turned into some "trendy" bar where your constantly dictated on how to dress and forced to listen to rubbish loud dance music and if thats not enough you have to put up with a bunch of general idiots who have no intelligence what so ever and think its hilarious to try and pick fights on you for dressing slightly different, and the best thing is most the people causing trouble are usually good mates with the bouncers. Mmmmmm a more continental environment for the tourists?!?!?! Before the licensing laws were relaxed the pubs would be closed by midnight, the clubs a little bit later. By 4 am the streets would be relatively clear of the drunken yobs wanting to fight the world. Now thanks to these relaxed laws there is no let up in the yobbish anti social behaviour. They continue drinking until they can't stand, the fighting, urinating, vomiting in doorways ,continues up until 8 or 9 am. The emergency services can not cope in the relentless weekend onslaught of pillocks they have to pick up, patch up or lock up. Thanks Labour, another job well done!!!!!!! !